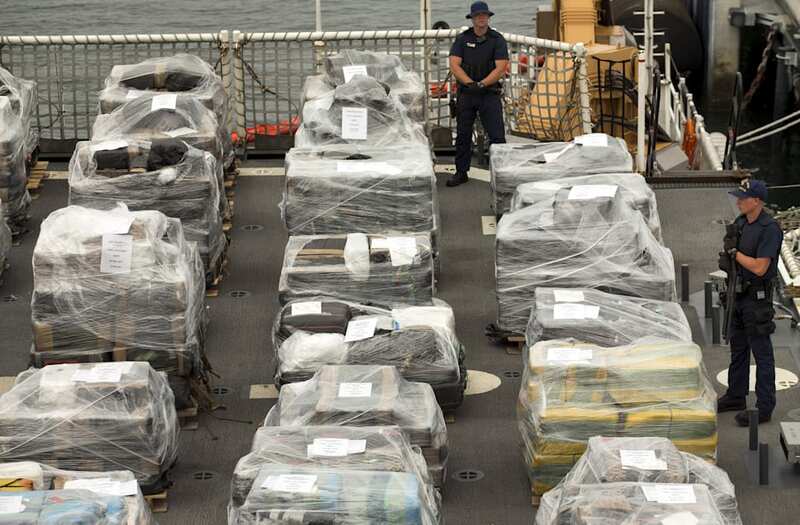 US Coast Guard officials have warned several times that their units are unable to keep up with the flows of illegal narcotics coming to the US from South and Central America. Vice Adm. Charles Ray, the Coast Guard's deputy commandant for operations, repeated those concerns on Tuesday during a hearing before the Senate Caucus on International Narcotics Control. "We have good intelligence on between 80% and 90% of these movements," Ray said, referring to trafficking in the eastern Pacific Ocean and Caribbean. "So we have good intelligence, [but] we only have the capacity to get after about 30% of those" shipments. Like Ray and US Southern Command chief Adm. Kurt Tidd, Coast Guard Commandant Adm. Paul Zukunft has warned about the gulf between what the service can see and what it can stop. "Just last year we had intelligence on nearly 580 possible shipments but couldn’t go intercept them because we didn’t have the ships or planes to go after them," he told The New York Times this summer. Coca and cocaine production in Colombia surged 134% between 2013 and 2016. The amount of export-quality cocaine produced in Colombia increased from 270 metric tons in 2013 to 910 metric tons in 2016, according to Iowa Republican Sen. Chuck Grassley, who is chairman of the caucus. Additionally, "the drugs are up 207% in coming in," Sen. Dianne Feinstein said during the hearing. Those increases have provided plenty of cargo for smugglers who ply a swath of the eastern Pacific Ocean the size of the continental US — from the west coast of South America to the Galapagos Islands and up to waters off western Mexico and the southwest US — according to Ray, who said the service's assets in the area were stretched thin. The Coast Guard, along with partners in the region, is tasked with patrolling the waters of the US's southern approaches. "On any given day we'll have between six to 10 Coast Guard cutters down here," Ray said. "If you imagine placing that on [an area the size of] the United States ... it's a capacity challenge." In 2016, the Coast Guard intercepted 45,000 pounds of cocaine with an estimated value of $6 billion. So far this year, the service has made a number of sizable seizures at sea. In March, a Coast Guard cutter unloaded 16 tons of cocaine seized by US and Canadian ships over a month period in the eastern Pacific. In May, a cutter unloaded 18.5 tons of the drug seized by six ships off the coasts of Central and South America. In June, another cutter unloaded 18 tons of the drug seized by it and other cutters in the eastern Pacific. Those seizures, and the gap Ray described between what the Coast Guard has intelligence on and what it can act, on would seem to indicate that a significant amount of narcotics is making its way past the US security assets deployed to intercept it. Asked by Feinstein about what was needed to address the flow of narcotics, Ray emphasized the Coast Guard's offshore-patrol-cutter program, which the service has said will bridge the gap between national-security cutters, which patrol open ocean, and fast-response cutters, which patrol closer to shore. The Coast Guard plans to spend $12.1 billion on the offshore-patrol cutters through 2032 (though the GAO has raised questions about the spending plan), but the first of the 25 cutters it plans to build isn't scheduled for delivery until 2021, meaning the Coast Guard is likely to grapple with balancing its priorities and its resources going forward. "The US Coast Guard is kind of doing it on their own. There have been pretty much zero naval assets in the Caribbean doing this for a few years," Adam Isacson, senior associate for defense oversight at the Washington Office on Latin America, told Business Insider. "Ultimately, as dire as the Coast Guard makes it out to be, it is ridiculous they can only get 30%," he added. "When you stack up all of the missions the Navy and Coast Guard are supposed to fulfill, this is low. It's low on the list."